Wisconsin Governor Scott Walker will address the annual meeting of the American Legislative Exchange Council (ALEC) in San Diego this July. Walker's speech at ALEC will be a reunion of sorts. Walker was an ALEC member as a state legislator in the 1990s, and the agenda that Walker has championed throughout his long political career has closely tracked the policies promoted by ALEC and its corporate funders, despite public opposition to many of those measures. More than 200 corporations and a quarter of state legislators belong to ALEC, where corporations vote as equals with state legislators on "model" bills before they are introduced in legislatures to become binding law. The group receives 98 percent of its funding from corporations like Shell, Peabody Energy, and Altria/Philip Morris, and from sources like the Koch family foundations, and many of the "model bills" that it has promoted -- from prison privatization to environmental deregulation -- directly benefit the financial interests of its funders. As a young legislator representing Wauwatosa, a majority-white suburb adjoining majority-minority Milwaukee, Scott Walker carved out a popular "tough-on-crime" niche. He chaired the Assembly Committee on Corrections and the Courts and worked with Wisconsin Governor Tommy Thompson, a fellow ALEC member, in a successful effort to pass ALEC's Truth in Sentencing bill in 1998, which eliminated parole and early release and had the effect of exploding prison populations. He also sponsored an array of bills to impose mandatory-minimum sentences on an array of nonviolent offenses and even to introduce chain gangs and prison labor. Rep. Walker would claim that he was the author of Truth in Sentencing, yet at the time he did not disclose to Wisconsin residents that the legislation actually came from ALEC. Walker also didn't disclose that private prison companies like Corrections Corporation of America (CCA) and Wackenhut (now GEO Group) were funders of ALEC and had representatives on ALEC's Criminal Justice Task Force. 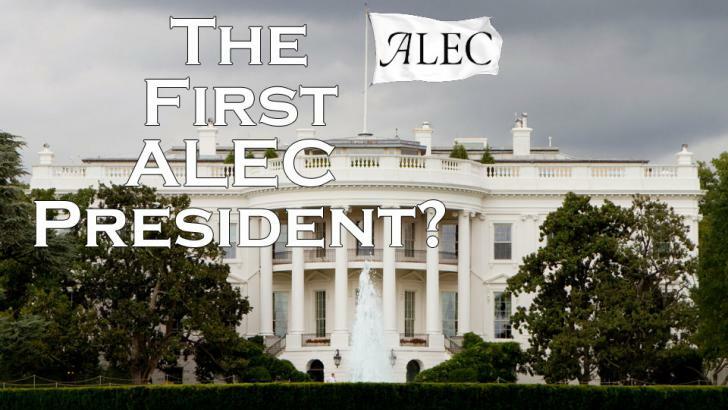 "Many of us, myself included, were members of ALEC," he said. "Clearly ALEC had proposed model legislation," Walker said in the interview, acknowledging that CCA and other ALEC funders stood to profit from tough-on-crime bills and prison privatization. 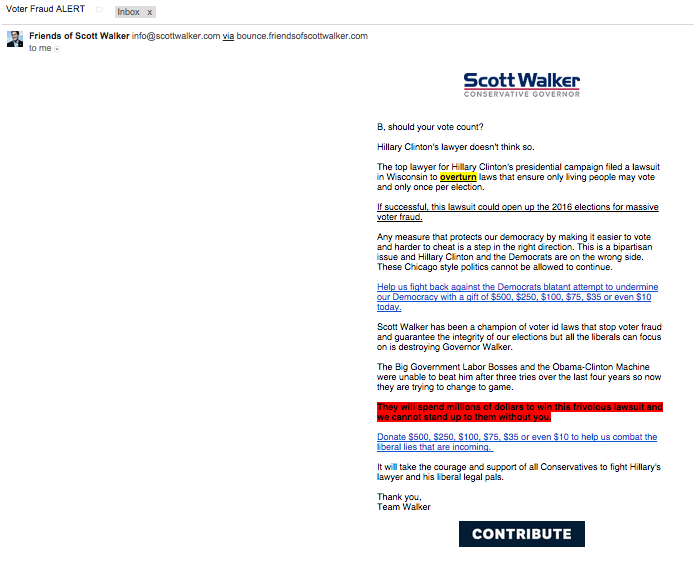 And Walker was an enthusiastic supporter of private prisons as an ALEC member. At the same time that he was pushing bills like Truth in Sentencing that grew prison populations, the young legislator was pushing to privatize the state's prison systems. "The ink on Thompson's signature [on Truth in Sentencing] was barely dry when Rep. Scott Walker (R-Wauwatosa) called for 3,000 more beds to house state prisoners," the Milwaukee Journal Sentinel wrote at the time. Not long after Truth in Sentencing became law, Walker introduced a bill to open the state to private prisons: "It only makes sense that we allow a private firm to build and operate an accredited facility in our own state," he said. Walker admitted to the Milwaukee Journal Sentinel in 1997 that he and Assembly Speaker Scott Jensen -- then the ALEC State Chair for Wisconsin -- had met with representatives of ALEC funder Wackenhut, and that ALEC funder CCA had also visited Wisconsin in a quest to build for-profit prisons in the state. Ultimately, bills to privatize Wisconsin prisons failed to become law, although the state did house prisoners in privately run out-of-state facilities for many years. Former Wisconsin Corrections Administrator Walter Dickey says he paid close attention to the debate over Truth in Sentencing and prison privatization in Madison, and "there was never any mention that ALEC or anybody else had any involvement" in the crafting of the bill. The impact of Walker's ALEC-inspired sentencing legislation has been disastrous. The state now spends more on prisons than it does on higher education. Wisconsin has the country's highest rate of African-American men behind bars, nearly double the national average. After Walker left the Assembly in 2002 to become Milwaukee County Executive, the state legislature began rolling back his Truth in Sentencing law. But when Walker entered the governor's office in 2011, he reversed this progress and pushed for legislation fully restoring the ALEC Truth in Sentencing requirements, despite the costs to taxpayers associated with incarcerating more prisoners for more time (approximately $32,000 each year), and despite claiming Wisconsin was "broke." In 2011 an arbitrator reversed Walker's outsourcing of courthouse security, and the county ended up having to cover back pay for the wrongfully laid-off union workers, costing taxpayers an extra $430,000. As Governor, Walker Pushed ALEC Agenda "Straight Out of the Gates"
After Walker entered the governor's office in 2011, he quickly pushed many ALEC priority measures "by request of the Governor." In his first year Walker signed into law 19 ALEC bills, which went after unions, preempted paid-sick-leave bills, enacted voter-ID restrictions, and made it harder to hold corporations accountable in the courts. The first bill Walker called for upon taking office was Senate Bill 1 (which became Act 2), an "omnibus" bill that, as the Center for Media and Democracy first reported, drew on numerous ALEC model bills to change liability rules and make it harder for Wisconsin families to hold corporations accountable when their products or activities cause injury or death. When asked by the Milwaukee Journal Sentinel if Governor Walker relied upon ALEC legislation when putting together this "tort reform" bill, Walker's press secretary, Cullen Werwie, replied, "Absolutely not." Yet the bill clearly reflected several pieces of ALEC model legislation, and while it was pending in the legislature, ALEC sent an email to Wisconsin members stating that ALEC "supports this legislation which includes numerous provisions that reflect ALEC's civil justice reform policy and model legislation." The bill's lead sponsor was Sen. Rich Zipperer, an ALEC Civil Justice Task Force member who would leave the legislature the following year to become Walker's deputy chief of staff and senior legal counsel. After Act 2 became law, ALEC issued a press release commending Walker and the legislature "for their immediate attention to reforming the state's legal system." A few months later the ALEC Civil Justice Task Force held a presentation on the measures, titled "Wisconsin: Straight Out of the Gates," to laud Walker and the legislature's new Republican majority for quickly implementing the ALEC agenda. Act 1 (Health Savings Accounts), a tax break that shifts cost burdens to individual policy holders. Act 9 (Super Majority Act), which would allow a minority of legislators to block a majority vote to raise taxes (supported by Grover Norquist's Americans for Tax Reform, a long-time ALEC member). S.B. 13 (the Drug Liability Act), which would bar almost all suits by Wisconsin residents if a drug or medical device kills or injures a member of their family. Act 93 (the Trespasser Responsibility Act), which limits a property owners' liability for injuries to others. Act 22 (Telecommunications Modernization Act), which deregulates the telecommunications industry. A.B. 14 (Interest Rate Judgment Act), which would have reduced the interest rate on court-ordered payments for Wisconsin families injured or killed by corporations. Act 21 (Economic Impact Statement Act), which places hurdles on promulgating regulations, including regulations to ensure cleaner water and air for Wisconsin families. In subsequent years Walker continued to push ALEC agenda items, particularly education privatization measures -- and often by way of the governor's biennial state budget, which limits public discussion and debate. Walker's 2013-2015 budget included several ALEC-inspired measures to transform and privatize the public school system, with provisions limiting local school-board oversight for charter schools, expanding "voucher" programs, and creating new teaching licenses for individuals with no education background. His 2015-2017 budget called for cutting $127 million from K-12 public schools and, at the same time, spending millions on expanding vouchers to send taxpayer funds to private schools, and for creating a new voucher program for students with disabilities. Just days after Walker was first sworn in as governor in January 2011, he spoke frankly about his plans to "divide and conquer" Wisconsin unions in a conversation with billionaire GOP financier Diane Hendricks, who is now on the board of the Milwaukee-based Bradley Foundation, a major funder of ALEC. "Any chance we'll ever get to be a completely red state and work on these unions and become a 'right-to-work' [state]?" Hendricks asked Walker in a conversation that was videotaped by a documentary filmmaker and released the following year. Walker replied, "Well, we're going to start in a couple of weeks with our budget-adjustment bill. The first step is we're going to deal with collective bargaining for all public employee unions, because you use 'divide and conquer.' ... [T]hat opens the door once we do that." A few weeks later Walker introduced his signature union-busting bill, the incredibly controversial Act 10, which had roots in ALEC model legislation. A key element of Act 10, which prohibits the state from collecting union dues from public-sector employees, reflects ALEC's Public Employer Payroll Deduction Policy Act. In early 2015, not long after Walker started his full second term in office, he fulfilled the second step of his divide-and-conquer plan: He signed a so-called "right-to-work" bill that took aim at private-sector unions, despite having pledged that the legislation wouldn't come to his desk. The bill was a word-for-word copy of the ALEC Right to Work Act. And it is not over. Wisconsin Senator Leah Vukmir, the treasurer of ALEC's national board, is pushing an ALEC-inspired bill to repeal the state's prevailing wage law, which would have the effect of lowering wages in the high-skill construction industry. In 2008 Milwaukee became the third U.S. city -- after San Francisco and Washington, D.C. -- to guarantee paid sick leave for workers, thanks to a referendum overwhelmingly approved by over 70 percent of the city's voters. "This law removes another barrier in the road to creating 250,000 private sector jobs by 2015," Walker said at the time. Yet crushing local control, like busting unions and slashing taxes for the rich, didn't lead to the promised economic growth. Walker barely met half of his pledge to create 250,000 jobs in his first term, and Wisconsin's job creation lags behind that of its neighboring states. Although Wisconsin's bill to preempt local paid-sick-leave initiatives did nothing for job creation, it was great for the bottom line of big restaurant chains, and a few months after Walker signed the legislation, it was brought to ALEC's August 2011 Annual Meeting in New Orleans and shared at the Labor and Business Regulation Subcommittee of the ALEC Commerce, Insurance and Economic Development Task Force. At the time, ALEC's Labor and Business Regulation Subcommittee was co-chaired by YUM! Brands, Inc., which owns Kentucky Fried Chicken, Pizza Hut and Taco Bell. Attendees were given complete copies of the Wisconsin bill as a model for state override. Legislators were also handed a target list and map of state and local paid-sick-leave policies prepared by the National Restaurant Association (NRA), an ALEC member. Both YUM! and the NRA have been leaders in the fight to stop paid-sick-leave bills across the country. Since that meeting, paid-sick-leave preemption bills have spread across the country, in most cases sponsored by ALEC members. Eleven states now have stripped local governments of their power to enact paid-sick-leave ordinances, and nine of these laws were passed since 2012 (Alabama, Arizona, Florida, Indiana, Kansas, Louisiana, Mississippi, Oklahoma, and Tennessee). "I Don't Want Everybody to Vote"
Wisconsin's ties with ALEC go back for decades. One of ALEC's founders was right-wing political apparatchik Paul Weyrich, a Racine, Wisconsin, native who famously said, "I don't want everybody to vote. Elections are not won by a majority of people. They never have been from the beginning of our country, and they are not now. As a matter of fact, our leverage in the elections quite candidly goes up as the voting populace goes down." This spirit is reflected in ALEC's push for "voter ID," which purports to address the statistically nonexistent (but greatly hyped) issue of voter fraud, and which has the very real effect of making it harder for students, people of color, and the elderly to cast ballots. Walker has boasted that he was the "author of the first bill to require voters to show photo ID at the polls" as a legislator, and in 2011, with recall elections looming, Rep. Robin Vos, ALEC State Chair, halted work on the biannual budget to rush an ALEC-inspired voter-ID law through the legislature. Over 300,000 people in Wisconsin -- primarily people of color and students -- lack the specific kinds of identification now required to vote under the new Wisconsin law, according to testimony from University of Wisconsin professor Kenneth Mayer. State and federal judges initially blocked the law's implementation, but after years of legal challenges, Wisconsin's ALEC-inspired voter restriction will take effect this year. Walker has repeatedly boasted about the voter-ID measure on the presidential campaign trail and continues to stoke discredited fears of voter fraud. On June 2, for example, his campaign sent out a fundraising email titled "Voter Fraud ALERT," declaring that "Scott Walker has been a champion of voter ID laws" but alleging that a recent lawsuit challenging Wisconsin's voter-suppression measures "could open up the 2016 elections for massive voter fraud." Scott Walker learned early that if he continued to move the ALEC ideological and corporate agenda, he would attract and be rewarded by the same deep-pocketed ideological and corporate donors who fund ALEC. The Kochs, for example, have been among Walker's biggest backers as well as major funders of ALEC, spending at least $11.6 million supporting Walker's gubernatorial campaigns since 2010. And the Kochs' sprawling political network might help propel Walker to the presidency. 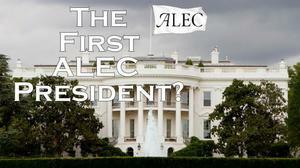 Learn more about ALEC at ALECexposed.org, a project of the Center for Media and Democracy.